There is a peach tree in the back yard that decides once every few years he will grow some good peaches. This was one of those years! The peaches come along faster than I can keep up with them. 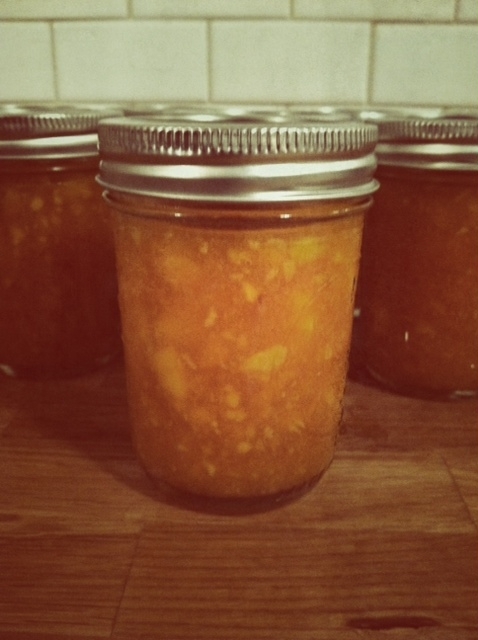 This year, we got smart and made Peach Freezer Jam. Any fruit would work but we were up to our neck in peaches. 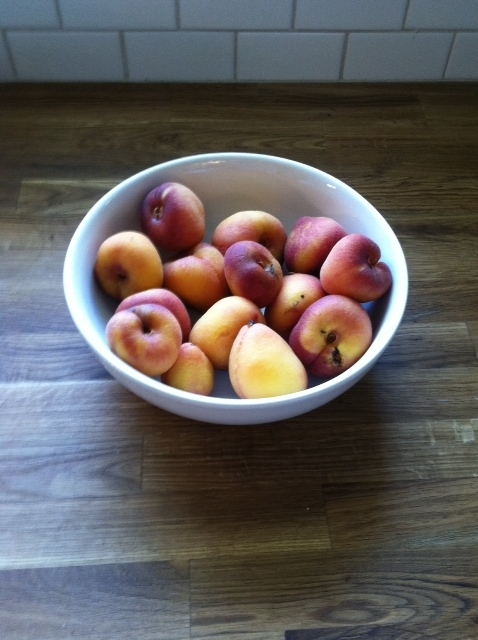 The peaches were small but very sweet. 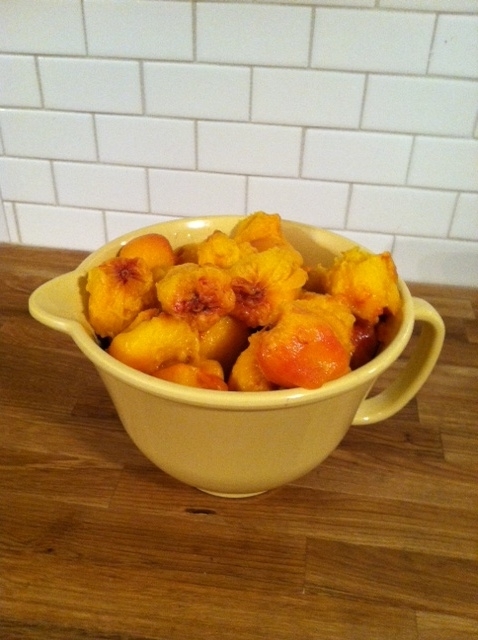 We blanched the peaches and peeled them so that we didn’t lose much meat from the fruit before we pitted them. Now for the fun part, filling the jars. 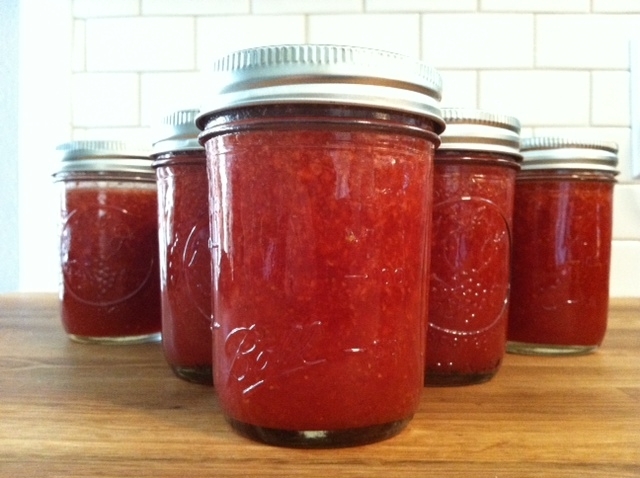 This recipe makes 8, 8 oz jars of jam. Rinse 8-8oz jars and lids with boiling water. Dry thoroughly and set aside on a towel. Bring a large pot of water to a boil and prepare a large bowl of water with ice. Mark a small x on the bottom of each peach and place a few peaches at a time into boiling water for one minute. Remove the peaches and place them into the ice bath for one minute. Now the peaches should be easy to peel. Repeat the process until all the peaches are peeled and the seed is removed. Place 4 cups of peeled and pitted peaches into a food processor and pulse. This is where you decide how big you want the bits of fruit to be in your jam. I didn’t puree mine, but I didn’t leave large hunks of peach either. Pour the peaches into a saucepan over medium high heat just until they boil. Remove from heat and add lemon juice(and cinnamon if you are using it) . In a separate saucepan, stir together sure gel, sugar and water. Whisk constantly over medium high heat until boiling. Whisk for one minute after it starts boiling and remove from heat. Immediately add the sugar mixture to the peaches. Stir until well combined. 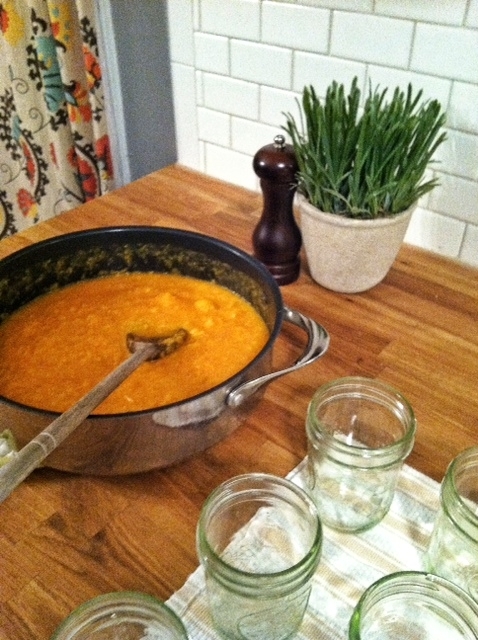 Using a ladle or a glass measuring cup (with a spout) fill each 8 oz jar. Leave a 1/2 an inch space at the top for them to expand in the freezer. 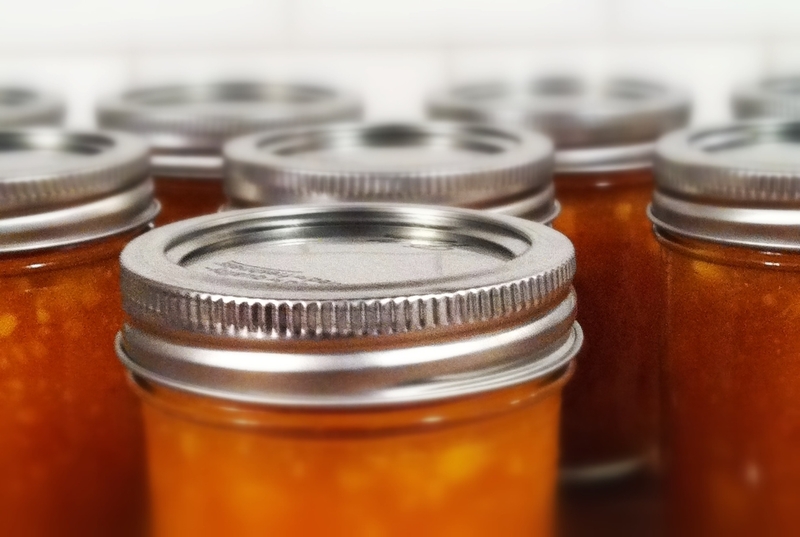 Let the jars sit out on the counter for 24 hours. Now your jam is ready to eat! Store in the fridge for 3 weeks or the freezer for up to a year! 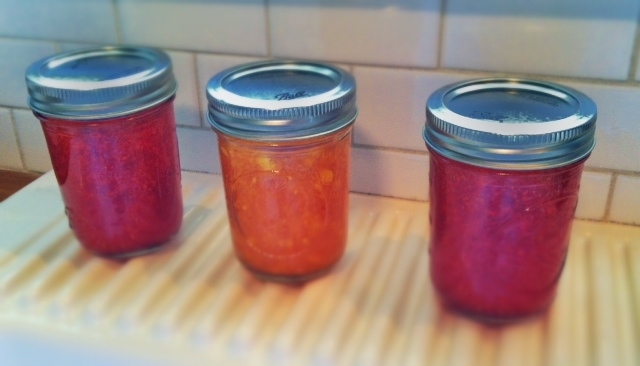 If you freeze the jam, thaw in the fridge before using. 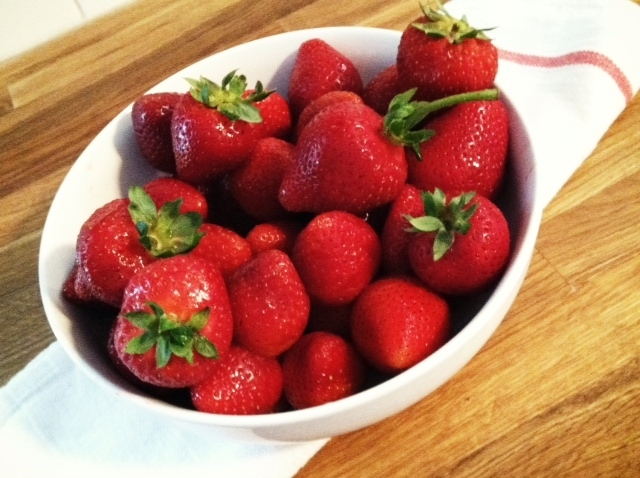 We had so much fun making the peach that we picked up some strawberries. If you use a fruit that doesn’t have to be peeled, just start with the step where you put the fruit into the food processor. And then we made some more peach. 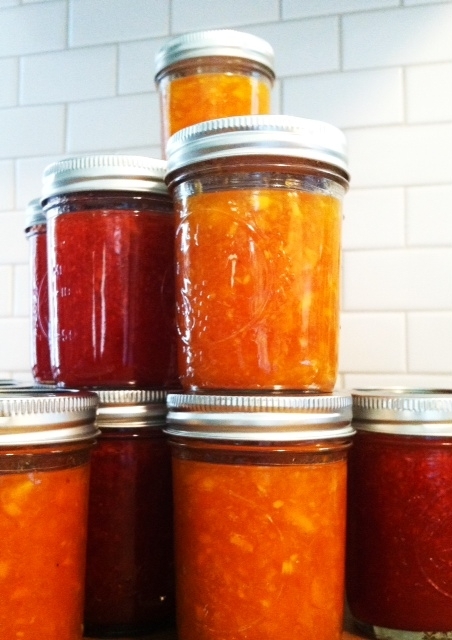 Peach and strawberry jam…back together again! That’s a lot of damn jam. Now go make some jam people! 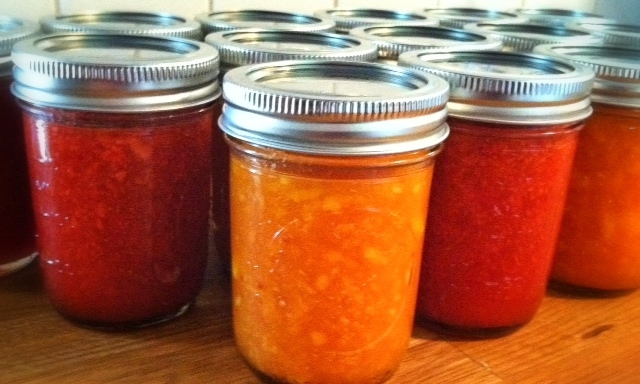 WHAT IS YOUR FAVORITE FLAVOR JAM, JELLY OR PRESERVES? ?